The aspect of performance has been insisted as an indispensable need for any IT and business application to be competitive in this knowledge-driven world. End users are always delighted with high-performance systems. Performance has been one of the prominent nonfunctional requirements (NFRs) and the leading quality of service (QoS) attribute for any IT-enabled solution to enjoy continued success. Poor application performance causes corporates to lose customers, reduce employee productivity, and decrement bottom-line revenue. Therefore, while designing, developing, and delivering software applications, application designers, architects, developers, and IT administrators need to take extra care at every layer and level for arriving at high-performance software packages. Considering the growing importance and influence, the field of “high-performance computing (HPC)” is increasingly drawing the attention of academic professors and industry professionals. Several industry domains and business verticals yearn for high-performance IT to be remarkably right and relevant to their customers and consumers. Hence, it is no doubt that next-generation applications ought to be high performing to be distinct in their operations, outputs, and outlooks by spontaneously absorbing all kinds of proven and potential high-performance algorithms and implementation techniques. There are several pioneering technologies, tools, and tips emerging and evolving to facilitate the realization of HPC goals that in turn substantially simplify and streamline the process of producing and sustaining next-generation applications. There are exemplary and easy-to-use computing models, architectures, infrastructures, patterns, practices, and processes in plenty to sagaciously steer the implementation, deployment, and delivery of high-performance services. 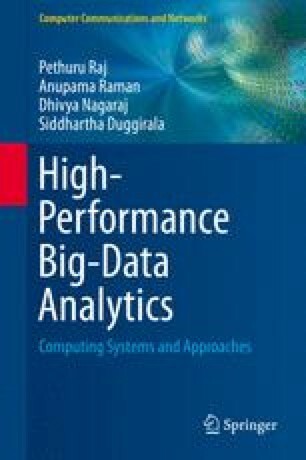 In this chapter, we are to specifically focus on the field of big data analytics (BDA) and how the various HPC mechanisms collectively are to fulfill the varied expectations of business executives, data scientists, statisticians, and other stakeholders in quickly and efficiently extracting all kinds of hidden patterns, associations, tips, fresh possibilities, and opportunities and other kinds of insights to empower institutions as well as individuals to act intelligently in their actions and reactions.